This follows a pattern of ideologically-motivated linguistic balkanization intended to limit the impact of specific ideas among Europeans, as in the conspicuous failure to translate into English Nobel Prize-winning author Aleksandr Solzhenitsyn’s Two Hundred Years Together (2003), or the works of NS ideologist Alfred Rosenberg. The Hoover representative on the mission was Pulitzer Prize-winning foreign correspondent Louis P. Lochner, who had reported from Germany for 20 years prior to WWII, first as an Associated Press and then an NBC radio correspondent. Lochner was an Illinois-born, University of Wisconsin-educated German American Lutheran. Toward the end of his life, in 1971, he moved permanently to Germany, where he died a few years later. In addition to these versions, I must mention a 2-part online article by the pseudonymous (I assume) Dalton, described as “a professor of humanities at an American university,” “Goebbels and the Jews,” Part 1 and Part 2 (2010). (Dalton is the author of Debating the Holocaust: A New Look at Both Sides [Theses & Dissertations Press, 2009]). David Irving, “Revelations from Goebbels’ Diary: Bringing to Light Secrets of Hitler’s Propaganda Minister,” Journal of Historical Review (January–February 1995), pp. 2–17. 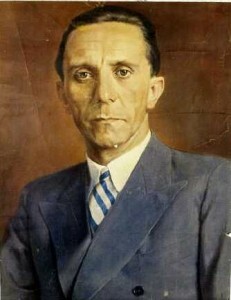 Nazi Propaganda by Joseph Goebbels, 1933–1945. 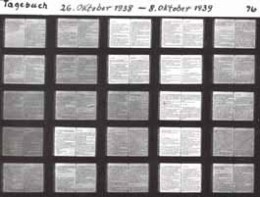 An online collection of English translations of selected speeches and weekly articles for Das Reich. Mark Weber, “Goebbels’ Place in History,” Journal of Historical Review (January–February 1995), pp. 19–21. Since Goebbels set forth an enlightened view similar to that endorsed by many in the German military and NS elite, but contrary to Hitler’s actual position, one would need to compare his guidelines carefully with the views expressed in his private diaries to ascertain whether Goebbels really supported the dissident position, or was simply instructing journalists to lie about Germany’s true intentions. Published: May 20, 2013 | This entry was posted in North American New Right and tagged Andrew Hamilton, articles, David Irving, Joseph Goebbels, Lochner, Louis, North American New Right, originals, the Jewish question, the Third Reich, World War II. Both comments and trackbacks are currently closed. 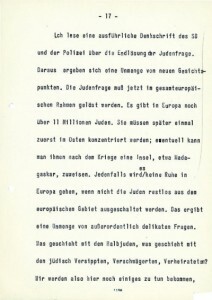 Does anyone know if an English translation of the 1944 diary is available ? If so who the author may be? I have the diaries from January 1939 – April 1945 missing 1944 appreciate any help you can give thank you in advance. For those seeking an excellent, scholarly and sympathetic history of the real nature of the Third Reich, may I suggest a new book that has just come out by Richard Tedor entitled -HITLER’S REVOLUTION. I will have to say that I disliked the snide, polemical tone of Irving’s Biography of Goebbels as well. I think that Irving later admitted that he injected the ludicrous canards in order to entice a mainstream publisher into distributing his work, and thus restore him to “respectability”, and lucre in the publishing industry. And, this unrealistic hope after he had endorsed and published the Leuchter Report! At any rate, Goebbels was obviously an intellectual genius of the first order, whose works really do need to be published in many languages. All we now have in English are really bits and pieces of his work, whereas, in addition to the voluminous diaries, there are his many speeches and writings, which need to be collected and published in proper translation. See for example ‘Die Zeit Ohne Beispiel’, ‘Der Steile Aufstieg’, ‘Wetterleuchten’ etc. I believe I read somewhere, that part of the problem is that somebody in the occupied German rump state, through officially sanctioned legal sleight-of-hand, holds the copyright, and is suppressing the publication of his important works. Very interesting. 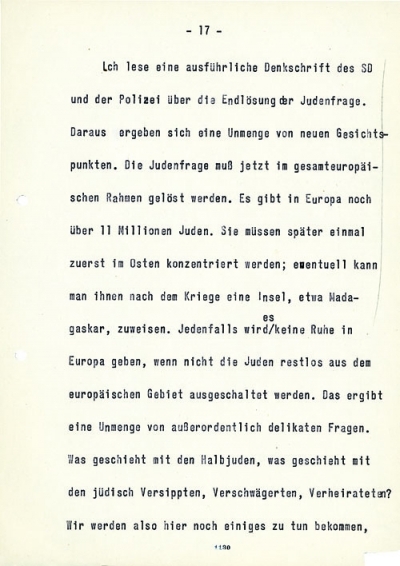 I knew that Goebbels kept a diary, and the Neuschwabenland Archive has a .pdf of the Kaiserhof zur Reichskanzlei book, but not having looked into it yet I had no idea the whole thing is more than ten thousand pages long. Looks like this is going to be quite an investment. There’s a pretty entertaining biographical film called The Goebbels Experiment, which contains roughly one and a half hours worth of quotes from the diaries, without additional comments. It aired on German state television a few years ago, so they were probably not exactly trying to pick the quotes that provide the most insight into the nature of the enemy. But the result is interesting nonetheless. You can find both the German and the English version on Youtube. But alas it’s in German. Are there any reliable English translations of this anywhere? I haven’t spent too much time studying the personalities of the NS figureheads but I’d be interested in reading what Goebbels had to say. 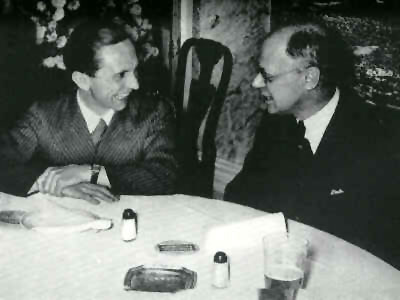 I’ve not been too impressed with some of them, Ribbentrop for example, but I’d say with sincerity that it’s undeniable that Joseph Goebbels had the courage of his convictions; demonstrated by the very fact that he personally stayed in Berlin to defend it when the combined armies of the USSR, America and the British Empire were butchering their way toward it.